The press release talks about the report as being a way to provide independent input into the Auckland Transport Alignment Project (ATAP). This is quite funny as the majority of the graphs, and figures they quote come are cut and pasted from the Auckland Council, Auckland Transport, NZ Transport Agency or the Ministry of Transport, the four agencies at the centre of ATAP. Some of the information even comes directly from the ATAP foundation report. There also seem to be a lot of contradictions within the report, they’ll make a fairly accurate statement (often similar to what we may say) about a project or piece of analysis but they’ll then hand wave that away and ignore it when coming up with their conclusions. I’ll cover some of these within the post. Throughout the report there is a lot of discussion on the role of public transport and the NZCID make a number of astute observations about PT and how it is assessed. Examples include how odd it is that for processes like ATAP that PT is treated differently to cars in the modelling, as if PT users time don’t consider their time as important. Also significant is the fact that public transport accessibility is modelled on a 45 minute door-to-door commute. Cars, on the other hand, are modelled on a 30 minute door-to-door commute. The need to assume an additional 15 minute or 50 per cent travel time for public transport is understandable in light of the need for users to get to and from services, but there is no evidence that it meets user expectations. It is not clear that the majority of transport users consider an additional 15 minute or 50 per cent travel time to be a truly viable alternative. A common refrain from many is that building more carparks at train/busway stations is needed to significantly boost patronage and it’s also something mentioned in their press release. However this is actually a bit at odds with their report itself which while enthusiastic on PT, notes that it isn’t cheap to more capacity, that people should be charged to use carparking spaces through their HOP card and also doesn’t add all that much to PT usage. Given the conclusions they’ve come to over P&R it’s amazing that they then say it should be vastly increased. Equally odd is that they seem to come to the overall conclusion of “it’s crap so we might as well invest in roads instead”. If the investment in PT is as poor as they suggest then why has almost no effort has been made to look and see if there are any better was to invest that other than through more roads. The levels of service required to lift public transport patronage by attracting users away from private vehicles are unaffordable and will deliver less value for money than extensions of the road network. The report’s discussion of Land Use is perhaps one area where I’m in quite a bit of agreement. They quite rightly note that through the Unitary Plan, not enough growth has been enabled in areas with the best planned public transport such as along some of the train lines and the busway. 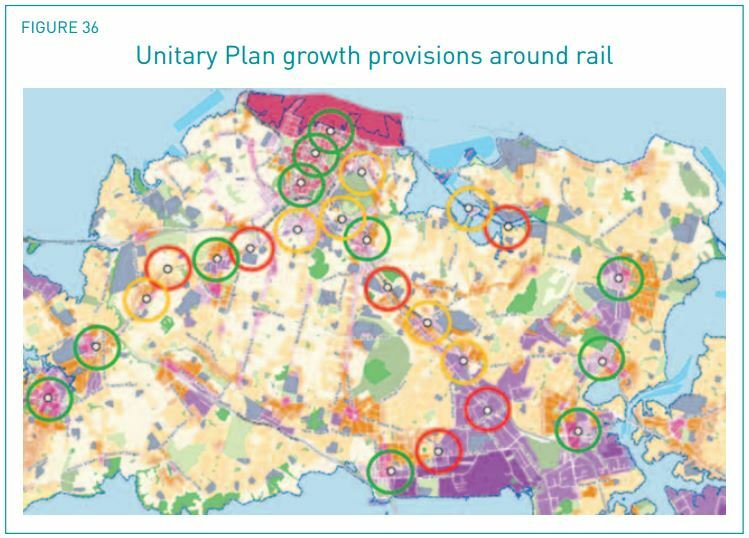 Figure 36 shows Unitary Plan growth provisions on the Auckland isthmus and rail stations. Circle sizes indicate an approximate 10 minute walk to rail services. 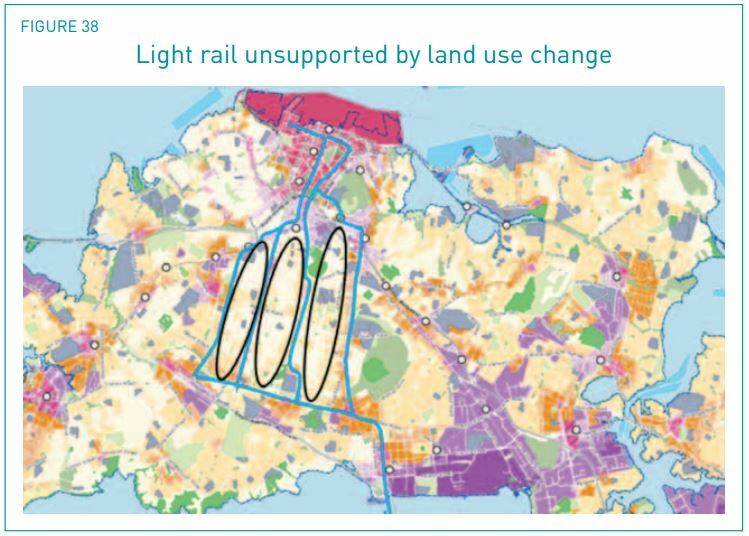 Development should, if Auckland’s very significant sunk investment in rail is to be maximised, be permitted inside these circles as a means to improving the convenience and attractiveness of public transport. In reality, significant land use change around the majority of stations on the isthmus – the area where demand for land is highest and where most growth under a compact model should in theory be accommodated – is not permitted under the Unitary Plan. The type of development activities which would benefit from access to rail, such as residential apartments and town houses, are only substantively permitted around 11 of the 24 stations on the isthmus (indicated in green). Development change is generally prohibited around 6 of the stations (indicated in red) and a further 7 permit some degree of change (indicated by orange circles). The lack of development allowed around the Northern Busway stations with more development allowed along the Onewa and Glenfield Rd corridors. In the south they suggest Greenfield industrial land could allow for current industrial land around stations to be redeveloped, one example sited is around Te Mahia where they say the “low value industrial land around the station” could have been rezoned to tie in with improvements to the station and the golf course development which they criticise as not being dense enough. They say (like we have before), that only the West has significant levels of growth permitted around stations and elsewhere like on the Te Atatu Peninsula. But they also say that the growth there is poorly aligned with the priority of transport projects (i.e. Northwest Busway) and the business cases for the investment in the PT needed will be undermined by the lack of development allowed closer to the city. Ultimately much of the NZCID’s suggestions come down to the mantra of build more roads, even going so far as to suggest that we’re too auto-dependent so should just keep building more roads anyway while also claiming that will stop congestion getting worse. Aligning land use provisions with current and future transport investment will go some way to alleviating pressure on Auckland’s congested road network. Integrated policy cannot, however, undo 70 years of investment and development, nor can it completely remove the need for road travel. Capacity in the road network is the only means to stop congestion expanding further into the interpeak, impeding commercial movement, and emerging through weekends and the off-peak, undermining liveability, social opportunity and the attractiveness of Auckland as a destination for labour and investment. And that motorways are magic economic machines. Motorway capacity is essential because motorways generate economic activity. Making the Mill Rd project bigger and grade separating it so essentially a motorway. Linking in the Eastern Motorway with Te Irirangi Dr and turning that into a motorway using money destined for the AMETI busway. Here’s what they say about the AWHC and Eastern motorway. They are quite correct that the AWHC as it stands is a poor outcome but doubling down and making it bigger it is definitely not the answer. Also providing new links between Northland and the Waikato is exactly the purpose of the Western Ring Route that isn’t even finished yet. The proposed Additional Waitemata Harbour Crossing is throttled at both its northern and southern termination points, constraining its potential. It cannot connect new businesses and communities and it cannot lift the opportunities for the region, as its predecessor, the Auckland Harbour Bridge has done. Consequently, it cannot deliver economic and social benefits consistent with its high cost and these limitations are highlighted by conventional cost benefit analysis which shows a return of 40 cents for every dollar invested. An Additional Waitemata Harbour Tunnel landing to the east of the CBD may be able to do better. Connecting with State Highway 16 south of the Port of Auckland and continuing underground to protect environmentally sensitive estuary habitats around the Orakei Basin, an Additional Waitemata Harbour Tunnel can become the new lynchpin for an entire network linking Northland and Waikato, Albany and Penrose, Glen Innes and the CBD. Overall there are a few things in the report we agree with but it’s mostly just about trying to justify a heap of roads. If PT isn’t good enough then they should be proposing to dramatically fix that rather than just accepting it and saying build roads instead. Day 3 new timetable. 6:54 am. Half trains cancelled from papakura. Only 3 car train shows up. About a quarter of people left on platform to catch next train. Perhaps instead of multi story park and ride car parks we need more trains. I think six car trains are needed on all services (including onehunga). Does anyone from AT and MoT read this blog? The extra $200 million is worth it. You are not going to make it to CRL with the current rail stock. Seems a bit overkill having 6-car trains on Onehunga services, they very rarely have all of the seats full at the moment. I agree though regarding the new timetable. It looks like some of the 6-car sets out south have been moved to the Western line as they are now 3-car sets and have been at crush capacity and leaving people behind. Yes, at the moment six car sets for onehunga is not possible (I think onehunga station car only take a three car set). But we should buy the spare trains. My concern if the otahuhu train station interchange is anything like Panmure interchange then people will not be able to get on it after otahuhu (and in peak services at the moment people at otahuhu may not be able to get on the trains). I guess my point is unless there is sufficient capacity to allow more people to get on trains then there is no point spending lots of money building expensive multi story car parks to get more people on trains. If you look at the growth in patronage on rail network money spent on growing the capacity is well spent. My understanding is that the budgeted item for buying more trains as part of CRL has been deleted. We are hearing that change to the additional trains in the CRL budget is because of the realisation that they will be needed sooner. And, in fact, the CRL enables a higher level of utilisation than pre-CRL;l getting more work from the same number of machines. My concern is that because the CRL opening is still 6-7 years away the pent up demand will hit that system like a Tsunami, so the current models, as is usually the case with PT projects [despite what NZCID claim- without any evidence], are likely well short of actual numbers. At current growth and pattern change rates AKL is going to be a very different city in 6 years than it is now. Remember rail uptake is way out in front of population rise. And despite the hand ringing over the UP; the city is intensifying fast at the moment. 2. we may need more again with the CRL than they are currently assuming. Cancellations due to signal fault at Takanini iirc. From my observation western line peak services appear have replaced 2×6-car trains with 2×3-car and 1×6-car trains. Anyone know AT’s actual fleet allocation? 54 of the 57 units are booked for the new timetable in peak, which I think is two or three more than before. Given that there is usually one active spare, at least one in maintenance and one in testing, any more than one fault could mean 6-car sets being split or cancellations. Todays drama was reputedly caused by a freak external incident. The idea of trying to use Vienna and Zurich to justify a roads only transport plan is hilarious! Have they actually been to these cities, do they have any idea just how lavish the PT systems are there? Especially rail of all types? Perhaps when we have a full on street Light Rail Network, a complete underground Metro, and commuter and intercity trains running efficiently and frequently we can consider their lessons from overseas cities. It’s also pertinent from a roads-first perspective that most of Auckland’s arterials of 4+ lanes are bigger than and exhibit more or less the same car-only priority that the roads listed as freeways in Zurich are. As such the roading in Auckland is much more extensive and far more in favour of cars. Once you’re off the highways in Zurich the priority shift very much in favour of people in trams, bikes or on foot. Further, Zurich has long had a sinking cap on parking in the region, no additional parking spaces can be built, any new ones have to be offset by the removal of parking somewhere else. They built a motorway ring-road around 8 years ago, and importantly used the diverted through-traffic to then massively downsize roading, turning it into low-speed zones. Zurich also had consultants proposing bizarre freeway schemes, one of which proposed a freeway to run right through the centre of the city – the two stumps visible in the image above. Thankfully it was never connected up but has left a river scarred with a raised overpass along its length. 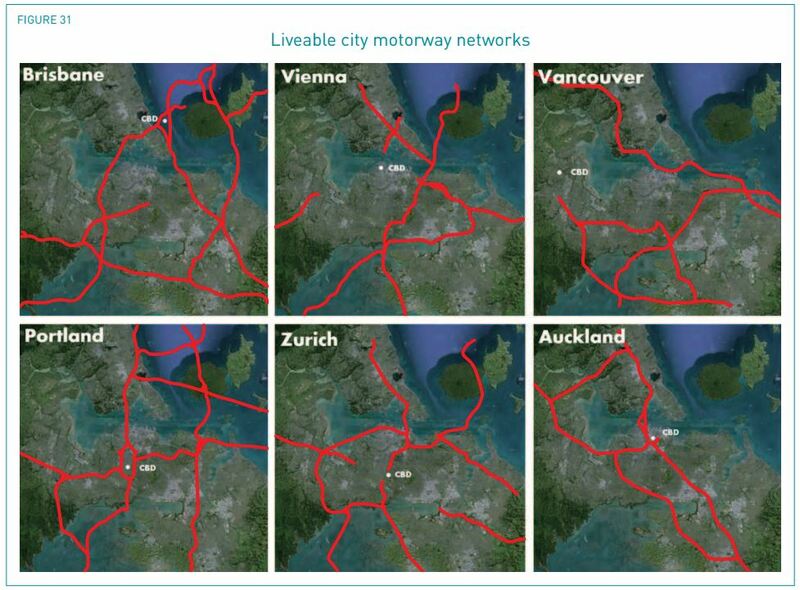 Maps of Liveable City Railway Networks would show a rather different picture: I wonder why they weren’t included too? Great – look forward to seeing them, and to their being picked up by NCID☺. The point regarding motorway connectivity in cities like Zurich and Vienna is exactly that – a point regarding motorways. I don’t think there are too many people likely to read the report who believe that Zurich and Vienna rely solely on motorways. The report separately calls for improved public transport services aligned with redevelopment – redevelopment which would look a lot more like what is seen in Vienna than the low density, cul-de-sac layout we have currently. Hamish that is disingenuous. Your report includes a plan for an absurdly expensive and largely useless $12 billion motorway, but there’s no commensurate plan for a rapid transit network for Auckland at even half that price. And hey, you could have easily used our one, or even Auckland Transport’s which is, after all remarkably similar, only spread out over far too much time. Anyway this just betrays the report’s failings as a means to understand how cities work; you cannot possibly make sense of Zurich, Vienna, or Vancouver without referencing all their transport systems. One network in isolation is meaningless. Well said. Can’t believe how one-dimensional the NZCID report was. Patrick, if Auckland Transport modelled your plan and it showed system wide congestion, would you take that as evidence of success or failure? This may be our point of difference because otherwise I am unable to explain your position. Congestion is bad. Wall to wall all day congestion across the state highway network which is what the modelling shows happens in ten years is really bad. Your plan which shares much with what is planned currently does not work. It simply does not work. That’s what the congestion modelling shows – network failure throughout the day. You might be able to get to the city the way you want, but everyone else – the modelling shows comprehensively – will be gridlocked ALL DAY. Businesses will die, people will lose their jobs. This is not a good outcome. You might not like a motorway. That’s fine, present a solution which materially reduces congestion so that people don’t lose their jobs. Hamish sounds like you don’t actually understand what we have proposed. The PT network is the most visible part but there is more to it. For one is timing which we think should happen sooner to help improve utilisation and behavior change. More nuanced and not as easy to see but the reality is that by in large, congestion isn’t being caused by trucks or people making business trips. It’s caused by too many single occupant vehicles. We want to see the focus go on moving people and on moving freight. Pushing for added capacity for business trips while ignoring that it’s SOVs causing the problem is blinkered thinking. We’ve suggested that truck lanes and/or other priority measures for some users to ensure that freight and business can happen. Essentially get the PT and active networks good enough that it’s viable for most “people” trips and then ensure the strategic road network is focused on the trips that can’t use other modes. That way if people choose to drive in the space that’s left for single occupant vehicles and there’s congestion for them then that’s their choice. I can’t see a way you will get public transport to be viable for “most” trips. For my family, the only time that would be practical is if we go into the CBD, which we try and avoid if at all possible. It could certainly be viable for more trips, but people don’t necessarily go where buses go. I looked today what it would take for me to go to the swimming pool via public transport. Best case scenario 50 minutes. In a car 15 minutes – worst case 25 minutes. Modelling is useful, and they are doing an awful lot of it through ATAP. But it does depend a great deal on the assumptions and inputs. For example the modelling for CCFAS assumed billions of dollars on additional urban motorways which of course generated a huge amount of driving, which was the primary reason that that model spat out no improvement to congestion. What ever we build will be used. New motorways generate new driving trips, these of course do not begin or end on the motorway; they are congestion creators. Additionally experience shows that our current transport models are particularly inaccurate predictors of PT uptake; consistently under picking pax, this was the case for the Northern Busway, for Britomart, for rail electrification. And while we are not modelling experts, we have looked at why this might be and basically concluded that there are all sorts of slanted assumptions buried in the detail that essentially penalise PT in general and rail in particular. In fact one AT expert we spoke to just said; ‘the model hates rail’. 1. adding more lanes in thriving cities does not ‘solve’ or ‘fix’ congestion, in fact it doubles down on it by increasing auto dependency: deepening congestion. 2. It completely ignore the role of investments in complementary modes to reduce the negative impacts of traffic congestion. Essentially the Nash Equilibrium shows how the quality of the alternative PT route sets the speed of the driving one. This is observable on the Northern Busway: The better the busway gets, the more people select that mode and driving speeds improve [or become less degraded]. If they improve sufficiently then people will switch back to driving until they are incentivised back to the Busway, etc This creates an equilibrium, where all travellers benefit from a faster, more comfortable, more frequent alternative. Especially if that route is part of a full Network, with supporting local feeders etc. 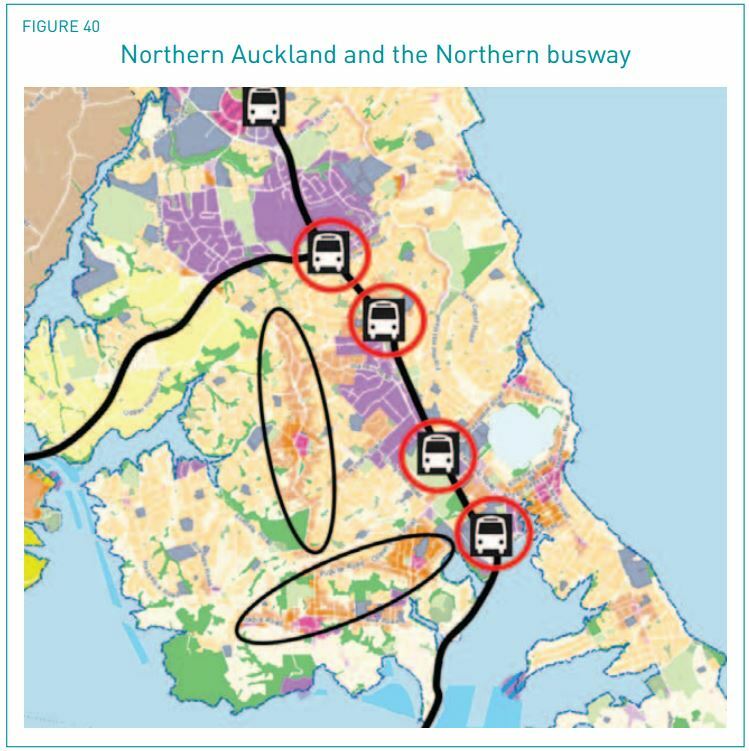 Anyway it is most easily observable every day in Auckland with the Northern Busway, and it will be in effect on the southern line too [otherwise no one would use the train!] but it is not as obvious as across the bridge, where it is easier to separate out from alternatives. Models are not reality. They are approximations, educated guesses, they are like weather forecasts -it could be right, it might be half right -it rains in the afternoon not the morning or it could be completely wrong -the disaster (cyclone say) went past us. They are only as good as their underlying assumptions and those assumptions can hide all kinds of biases. Just because Hamish says in 10 years time disaster will occur -there will be gridlock and a collapse of Auckland’s economy -doesn’t make it fact, an absolute certainty. Also Patrick Vancouver is a city that routinely celebrates its resistance to the plowing of motorways through its centre. It is significantly a PT and cycle city especially compared with new world anglo comparators. More evidence of the ridiculousness of those maps. And simply nonsense to compare with Vienna which is acknowledged to have one of the two best public transport systems in Europe. The system is apparently so good that the population seldom use other means to travel. The consequence is that it is enormously well patronized and as a consequence ridiculously cheap fares are possible – a yearly pass for about NZ $700 per year, or maybe this is part of the reason it is so well patronized. A – Trucks to and from the Port, carrying freight. B – People to and from the CBD, going to work. Hmmm. Answer to A could be more investment in freight on rail. Build a rail hub for the Port out in Panmure. There’s already the Wiri Inland Port that functions more or less as you outline. Just to clarify, the eastern motorway proposal we’ve suggested needs to be modelled begins on the north shore and would replace the current ‘western’ aligned harbour crossing, which most of you will know is throttled at both ends, reaches capacity within a decade and carries a BCR of 0.3 or 0.4 with WEBs. In other words, it’s not great. So the tunnel would start around northcote (though potentially Onewa Rd to reduce throttling) and would connect to SH16 at Grafton. It would continue underground through Orakei and would surface wherever is feasible. In effect this may be the commercial area to the east of St Johns Rd. We think of the project in two big parts, with the rest of the first part being how you connect this section of the east-west connection project while fixing up the Mt Wellington choke point. Don’t know how this would be achieved – tunnels or overland, but the idea is to provide an alternate to SH1 for interpeak travel which modelling shows will be required. Rail cannot do this job because interpeak travel is dispersed and often of a nature which is not amenable to PT (plumbers, couriers, etc). This sort of thing would cost perhaps $8-10 billion, so would require network tolling. Network tolling in the absence of this (or a similar) project risks becoming a punitive tool to disincentivise travel rather than a mechanism to maximise use of motorways and take pressure off local roads. Good summary of your work. I thought the WRR was supposed to be the needed alternative to SH1 for interpeak travel? do we need two alternatives? What exactly is the risk? We would get far more out of our roading network if we managed demand via market clearing road pricing. People who did not want to pay the toll could – travel at alternative times, carpool, not travel, take PT or walk or cycle. Isnt that what we want if it is more efficient? If the tolls are high enough that it means additional capacity is warranted (i.e. profitable) we could build it then, once we have had a chance to observe actual demand. Currently we can only observed unpriced demand which doesnt give us the information we need to know what real demand with efficient road pricing would be. mainly to enable tradies / deliveries / sales people to avoid congestion. The people driving these vehicles are likely getting paid upwards of $20/hour (or $1/ 3 min) so it would be worth them paying a $1 for every 3 minutes of delay avoided. Frank, if you can get a plumber for a mere $20 / hour, then I want to know their number! They charge out at a rate many times that – and yes, could easily soak up a $3 toll charge for getting to your house 10 minutes faster – it’ll just get billed back to the customer anyway. Arguably, if everyone driving a car just to get to work, took public transport instead, there would be no cars on the roads, just lines of vans and trucks. I’d love to see that day. Couriers, delivery vans, goods trucks and trailers, heavy vehicle haulage, logs to market and widgets incoming from China: those are all things that add to productivity and increase our GDP. But the rest, the commuters, should just get off the roads. Then we wouldn’t need to build another road, ever. End of story. We’re saying exactly the same things here. Toll the network as soon as reasonably possible. If everyone changes their habits in response and the motorways become freeflow without local road system failure, perfect! No more capacity needed, no more problem. We suspect that after a week or so of tolling, people will get over their dislike of tolls and motorway demand will again increase, albeit off a lower base. Some time in the next decade we will either have to increase tolls to the point where we are punishing people from using the motorway (unfair), rather than requiring them to pay for the cost of their actions (fair). This is the point at which new investment is undertaken, but we must plan (and consent) what our next response is now. We are calling for that planning and consent process to be seriously progressed on the best option, not to start building a new superhighway for fun. Do tell us how high the toll will be to cover the cost of your ~ $12billion+ eastern highway and harbour crossing? hamish – good to hear that you support road pricing. The goal of road pricing is not to provide free flow conditions, which would be an inefficient and uneconomic use of road space, but to maximise throughput. why are you so sure that there will still be demand for ever expanding road capacity? And surely if tolls are as high as it takes for the actions of the marginal user to be priced properly then they can’t be considered punitive even if they are extremely high. Patrick, the $2 “average toll” option from the council was estimated to raise about $12b over 30 years. That’s a good start. Frank, I don’t have the stats at hand, but I’d guess the amount of motorway lane per person in Auckland has been generally declining over the past few decades, so not sure what scale we’d need to effectively start running out of money, but guess it would be quite a bit more than an eastern motorway. But this is why tolls are important. I dont understand this from a desicion making perspective. At any given toll, some people will choose not to pay it, and others will. How does you description above feed into a desicion making framework for new investment. As Frank points out a rational desicion making criterion it would be about marginal cost vs marginal profit. By my calculation an average toll of $12 per vehicle using the eastern scene (I.e $24 return) would cover it. Sure Matthew, and if I get your question right, I think this is one of the key underlying issues we need to clarify not just here but at a public level. From a decision making perspective we’re trying to provide what people want. And by what they want, I mean, what they want at the price level they are prepared to pay. We (as in the vast majority of people in a liberal society – I suspect one or two on this site differ) don’t want other people to do what we say, we want them to do what they themselves want. What we ask is that they pay for the cost of their decisions. That’s easy in theory, but a bit trickier in practice, at least in transport where land use is so important. So with a tolling system, the point is not to “punish” (i.e. make them pay more than their fair share) people for using a road, just like it is improper to ask a PT user to cover 100% of their fare when roads gets rates funding. So to use a very rudimentary example, if it costs $100 to operate a tolled road, you want to get $100 in revenue. If you get less, you’re subsidising decisions and if you get more, where is the money going? If it’s not going into added capacity or a new road or PT improvement which takes cars off the toll road, then you’re spending the money elsewhere and effectively “robbing ‘Peter to pay Paul’. You’re also sending the wrong message to toll road users about the cost of their decisions and incentivising inefficient outcomes. I’ll add the point I made somewhere else on this page that, at least in my opinion, if the Government wants to use income taxes and GST to build “strategic” projects, which compete with hip operations and school funding, then that is absolutely the government’s prerogative (though ultimately the same argument applies in terms of a money merry-go-round). The objective, as far as I can see, is simply to make sure we’re not telling people to travel in a way they don’t want by overcharging them, nor force them to only travel one way by not giving them options. I am not sure if it is just the way you wrote it, but as well as operational costs you need to include the cost of capital. Where does the money go? It goes to the owner as a return on capital. The government owns $20billion (?) worth of roads and gets no return on this investment. Hence there is an economic distortion and subsidy to road use. If we put a motorway toll on all existing roads, the return on capital is just that, and should go to the owner. Transpower pays a profit to its shareholder (the government). Is that robbing Peter to pay Paul? Same with all the other SOEs. Take a transportation related example – Air NZ. Is its dividend to the government robbing Peter to pay Paul? Should that money only be spent on more air travel? You are absolutely wrong Hamish. The value of tolling has little to do with the cost of collecting the toll. You need to stop seeing it as harvesting cash and start to understand the concept of economic externalities. The value of congestion pricing is to ensure people include into their decision of how and when to travel the impact they have on others. The correct price is the marginal cost including the externality. If you gather more than it costs to collect (which you will) then you get an opportunity to use that money to further improve transport by either improving public transport or if it makes sense to build additional capacity. The problem is every time congestion charges are raised the infrastructure lobby jumps in like a robbers dog to try and claim the cash. The public then see it as a cash grab with them being fleeced and the whole debate is over before it starts. Congestion charging is the only chance to actually ‘fix’ transport and the best thing the infrastructure people could do is point out that pricing a public good with negative externalities is in everyone’s interest. Indeed. Well said, the seems to be no understanding of the of the currently underpriced externalities of auto-dependency at all in the NZCID report. However, they are completely right about the failure of the current AMETI plan to continue up the Pakuranga Highway. Clearly the capacity of that important route could be more than doubled overnight with continuous bus lanes along its length, taking up just two of its current 6 lanes. And this is something that could be done relatively quickly and cheaply. However the new volume of buses this would generate need somewhere to go which probably requires the next stage of AMETI to happen at the same time, which is currently languishing in a funding gap. Add to this the hopeless of the local political situation where all the political representatives are so busy yelling at Wellington to further destroy their area with huge, and hugely expensive, motorways-scaled roads that this actual solution has no champions; no wonder it slides down the list. This is so tragic as these politicians, both Central and Local, are simply flat wrong, their plans are a disaster, will not help drivers, especially at the peaks, and are simply a double-down, like the thrust of the report above, on more driving, more, congestion, more severance, in short, greater auto-dependency. And they have a total stranglehold over the debate in this area. Like NZCID their argument is the always logical road-drunk mantra: ‘This doesn’t work; we need more!’. They are right about a lot of things. The massive failures in leadership and planning around transit and where and how we develop housing can only result in more auto dependence. This is not NZCID’s fault and while they are not helping the ’cause’ this should be a pivot point for council and government to realise their failures and the cost, or for someone with some influence to point that out (rather than digs at NZCID). I feel that if this blog wrote the same report, it would be 87.3% the same, just with a different slant to the conclusion (that is, fix the fundamental issues vs doubling down). I asked the question yesterday and I will again: is there any sign of the current situation with housing and transit alignment changing enough to deal with the growth? We all know what it should be, but is reality (politics, planning) aligning? If it’s not, then, again, the only way forward is momentum, which is more roads. It’s a lazy politics based environmental and social disaster, this is just a symptom. David, wait for the Inpependent hearings panel on the Unitary Plan for alignment between transport and development. But you are still way too generous to NZCID, yes in places they have articulated the problem well, but their conclusions is all that is being reported and they are wildly wrong in them and do the debate and our city an enormous disservice with this aspect of their work. I agree regarding the disservice around the reporting of the report (can’t expect journalists to read the whole thing, surely? 🙂 ), and I agree that their understanding of transit and space efficiency is woefully lacking. This report highlights these facts and in their list of 10 items, 7 or 8 are completely solid. The other few align to their desires. If the first 7 points were followed then they would not get any extra work and we’d be in a much better place. It’s the first thinktank/lobby paper that even begins to identify the issues that will stymie the bettering of Auckland, and there is value in it in that regard. I look forward to the Independent report. I have no faith in local politics to do the right thing though – you still get Palimo or whatever his name is making nonsense claims and them getting spat out by the Herald without critical consideration, still have a council willing to bend at the tiniest sign of old people complaining, Central Govt still planning for the 70s. I think David is right. The transport system has been planned as if we will have a compact city but the land use hasn’t and probably never will be. The result is we assume future growth will occur near rail stations but it doesn’t. We are getting ever more distant suburbs as people work around failed planning rules. Lucky for us the developers are doing this as if it was left to the Council there would be nothing but extremely high houses prices, higher than we have. I don’t know why younger people stay in Auckland, it is failing them and wont be fixed any time soon. I certainly think David’s right! The point which he has clearly grasped and which must be addressed is that we are in crisis mode in the transport-urban development space. Crisis at the moment may be a bit strong on the transport side of things (depending where you live and when and how you travel), but not on housing. Crisis, I think, very accurately describes what ATAP modelling shows we’re facing within a decade. If you don’t like the eastern corridor, that’s fine, it’s a very big, very expensive project. But what you must do is provide a solution for commercial – commercial, commercial, commercial! – trips during the day. This will shock some reading this blog, but we’re not interested in building motorways to provide free-flow in the morning peak. We’re interested in keeping the Auckland economy afloat during the day. PT can’t do this for two reasons. First, we have a million people coming. Even if every single one of these is banned from owning a car, the commercial trips needed to service their needs will blow out the capacity of SH1 and the western ring route. Second, it is not reasonable nor efficient to get sales reps, home service vehicles, electricians, delivery vehicles, etc to use PT. I agree regarding moving commercial vehicles around, it’s often lost in the discussion on congestion. I would argue for taking the $8 – 10 billion (which admittedly isn’t budgeted for either way) and spending it on a high quality rapid transit system, which will take some but certainly not all traffic off the roads, but more importantly provide options, which would mean congestion charging and commercial vehicle lanes would likely be more palatable. What proportion of vehicles do deleveries / tradies make up at times of congestion? You’re really just making the case for road pricing rather than supersized capacity, to ensure that the highest value trips have priority. Of course road pricing wouldn’t provide the publicly funded construction binge that NZCID’s members are lobbying for. Hamish David’s right only in that you describe the problem competently but your solutions are nonsensical, grandiose, and confused. And simply do not follow from your description of the problem. You rightly finger ‘auto-dependency’ as a structural problem in Auckland, but demand a massive double down on even deeper auto-dependcy to solve it- please explain to us how that isn’t contradictory? It’s like saying the heroin addict’s problem really is just insufficient access to heroin. See the problem here? As for the important needs of commercial vehicles, we all agree, but it is the 77% light passenger vehicles on our roads that are holding them up, not a lack of motorways. Or at least there is a huge opportunity and responsibility to increase the efficiency of all our existing infrastructure before building unaffordable increases especially of what we already have. Until NZCID and the RTF start calling for rational non-infrastructure solutions they will be hard to take seriously. The obvious solution for commercial vehicles – hiding in plain sight – is privileged access to the existing state highways that after all were all built on this very same argument. Where is your call for truck lanes? Where is your understanding of the congestion generating function of Induced Demand that all new road building generates? Your blanket unsupported claim that all motorways, anywhere, and at any cost, generate positive economic benefits is frankly absurd. Imagine if you substituted another mode in that sentence would you still agree? Or are motorways, despite the current evidence of their malfunction, somehow uniquely magical money making machines? If that’s the case then why do we socialise their cost; if they are so wealth building where is the private sector desire to fund and profit from them? Lastly, do you understand any of the negative externalities of motorways, have you heard of the transport sector’s problem with Climate Change, and our increasing international agreements to address it? To be clear, our “solutions” are to model an eastern corridor to see whether the undoubtedly huge benefit offsets the equally undoubtedly large cost. If you present an empirically based alternative showing less congestion for less cost, I’m sure we’d be happy to endorse it, as would NZTA and AT. I think I’d use the analogy that doubling down on road investment is like eating lunch, personally – even though you’ve had breakfast, you still need more to live a healthy life. Motorways are not unaffordable if the people who use them pay for them. That’s supply and demand. We should do our best to make sure there’s no monopoly – we’d both agree on that – but providing what people want at the price they are prepared to pay is not a bad thing, even if it’s not what you want. Externalities are important – critical. Anthropomorphic climate change is a crisis, but the approach to addressing it by the anti-car brigade is not working – it’s failing spectacularly! It’s hard to prove, but it is almost certain that people are saying they want PT because to say otherwise makes you a bad person, but then not using it because cars off greater overall utility. The end result is no impact on carbon emissions, projects which don’t meet need and congestion. What will address carbon emissions is Elon Musk. It’s an understanding that the value people place on mobility exceeds the price they are prepared to place on the environment, despite this having disastrous repercussions. Electric (and eventually electric autonomous) vehicles are the best means to reduce transport emissions, not standing on the sidelines screaming at people for not doing what you want. Electric vehicles come with the added hitch that they will reduce “petrol taxes” by around 40%. Since static demand for road travel globally has been the result of, among other factors, increasing fuel prices, a fall of 40% or so on moving by car will increase demand for road travel on a per capita basis and we better prepare for that. Can’t agree with your comment “It’s hard to prove, but it is almost certain that people are saying they want PT because to say otherwise makes you a bad person, but then not using it because cars off greater overall utility.” The reason people still use cars as the predominant mode of transport is that they in the majority of instances offer the best mode of travel, but that doesn’t mean it’s a good option in many instances it will just be the best of a bad bunch. As we have built the Northern Busway and significantly improved the rail network people have shown they will shift to these as they offer the best mode of travel for those trips. The reason PT get high levels of support is people have seen these in action and want them where they live as well, and also have spent time living overseas when they were younger and want what they had in London etc here. Hamish, can you please explain your comment about electric vehicles vs petrol tax? Petrol taxes and Road User Charges cover the costs of maintaining and upgrading the road network. Electric vehicles currently have an exemption from Road User Charges, as an incentive to encourage their uptake. But in the long run they’ll need to pay the same as any other vehicle for their use of the road network. They’ll pay less in emissions taxes, but those are currently a negligibly small part of the overall taxes on petrol. And even a quite high carbon price of $100/ tonne would only add about 25 cents per litre to the petrol cost. Actually people know damn well what they want, and are not blinkered like your organisation by baseless and self-serving ideology. Your patronising ‘theory’ is ‘hard to prove’ because it is complete hogwash, and you know it. Certainly John, very rough figures of course because there’s lots of water to flow under the bridge yet regarding when or how electric vehicles pay their share of road costs, but in saying the cost of “fueling” an electric car could drop 40% I’m using 30c litre-equivalent to recharge an electric battery + around 80c litre-equivalent for road taxes (using FED). So ball park $1.10 or so if those numbers are correct, with NLTF charges applied, or a bit over half what we pay today. Not at all, Patrick, and you’re absolutely correct to underline the point with that graph. People are explicit in their support for PT, which is why we support it and support land use to further support it, as set out in the report. However, there’s some reason people are not getting on to public transport in the volumes required to make it a cost effective service compared to other options. It’s growing – fast – no question at all. But not fast enough to make PT anything close to a preferred mode choice for the overwhelming majority of travel in 30 years – despite massive investment. Something is not stacking up – and you know it. We say land use is the major factor in that. But what was highlighted in the AA survey, which came out after our report was complete, is that user expectations are very high for PT: people want it cheaper, faster, more reliable, more comfortable, etc. This suggests expectations may not be realistic, in other words, people are saying they want PT but setting the bar so high that we risk spending money on projects which do not yield a benefit comparable with their cost. This is what the modelling is showing in 30 years. I don’t know what else I can say – the modelling is the best evidence we have, you support it when it gives you the answer you want, it’s telling us the system won’t work, we must do something effective before it’s too late. Hamish, I strongly disagree that there’s going to be “massive investment” in PT in the next 30 years under current plans, certainly not in comparison to the spend on roads. I would categorise our Congestion Free Network as advocating “major investment” in PT, and that would have had roughly the same projects but over 15 years instead of 30. My view is that now is definitely the time for major, if not massive, investment in PT, and we’re certainly not getting it at the moment. Asides from the City Rail Link, there’s very little other significant infrastructure for PT planned in the next few years. I think the city and country will come to regret that. Also, and this relates more to another comment, you’ve highlighted the operational costs/ subsidies of PT. Those costs are real, but keep in mind that the main reason we subsidise PT is not as a kind of social welfare policy, but to mitigate congestion for car users. Certainly that’s the main factor in benefit cost analyses, and TransportBlog are big advocates for BCR analysis. This subsidy has a similar effect to road pricing, albeit not as well targeted. And if we introduced road pricing, we wouldn’t need to subsidise PT as much. This is not the criteria. Here you are inventing an irrelevant metric. We have already established above that PT has economic value that justifies its subsidy from other beneficiaries [road users and city citizens]. I’m sure you understand the difference between the financial and the economic, why pretend that the transfers designed to cover economic value suddenly have no basis now? This is to invent an arbitrary and unobtainable hurdle and would be the same as saying that because road systems are subject to congestion they are of no value. That is clearly not true and nor is the claim that because PT’s economic value is not perfectly captured through fares then it too ‘doesn’t work’. Additionally; no one can choose to ride a train that doesn’t exist, or offers such a substandard service as to poor value [in time and money]. To point to the current under developed PT system in AKL and say; ‘there, look AKL is different, no one wants to use PT’ is not a reasonable conclusion. And that is especially the case when it is attracting year on year 20% rise in ridership wherever improved services are now available. The trend is absolutely clear, and you would be well to not ignore it. Though we do *also* subsidise PT as a social welfare policy – for seniors, children, and tertiary students, for example. We also do so more vaguely for people on low incomes. It would be nice if the various subsidies were slightly more explicit – these subsidies are for concession fares, these subsidies are to make sure we cover deprived areas, these subsidies account for congestion, these subsidies are there to kickstart a service and provide patronage growth in the long run. Once we’ve accounted for those specific subsidies, we can expect PT to break even, and have a simple target to aim for. – should we try to convert the existing population to using PT? – should we organise the growth of Auckland in a way that new developments mostly happen in places where people can realistically use PT, or walk or ride the bicycle instead of driving? I currently live in the CBD. Lots of growth there. I can go shopping, go to the movies, go out eating, all without having to drive. I probably have more shops / cafes / restaurants etc. within a 10 minute walk, than a lot of other people in the suburbs within a 10 minute drive. And you never get stuck in traffic jams when walking. Contrast that with eg. the area around Birkenhead, where you have more or less congested streets at any time during daylight hours. I have lived there before, and I can assure you that driving from the front door to the mall there is a lot less convenient than walking to the shop in the CBD. Maybe the cheaper option is actually allowing building new developments in a way you don’t have to drive everywhere. The currently proposed rules read a bit like a black comedy in that regard. Coming from Belgium, I know how it will end if we go all in on cars. Not good. Just Say No. Wow, the Western Ring Route will be blown within a decade! You heard it first here folks! Hamish, if we build a proper PT transit system, the motorways and main arterials will be much less congested so your plumbers and courier vans and trucks have a better time of it on the roads. It is quite a simple point that you have completely ignored. Building more roads just encourages more use of those roads and therefore will lead directly to the clogging of those roads for your commercial vans. To me one thing is clear, the NZCID have no understanding of network effects or operations. The idea that the busway somehow is failing because you can’t build houses right next to the station belies the network. It’s a bit like saying the motorway will fail for the same reason, because the interchange at constellation drive doesn’t allow for intensification next to it either. They are right though, the North Shore’s premier rapid transit route should have higher density allowed around it. And much better bus and bike connections; expand the catchment as well as intensify in the walk-up. Note park and ride works against both. The northern busway is an enormous success and at no point in the report, nor even in the video to which I believe you Nick are referring, do we suggest this. What we do say is that there’s space on the busway for many more vehicles. We should start by trying to fill up that capacity with buses and one way to do this is with park and ride, because we know people really like the flexibility of dropping kids at school, parking at the station and stopping off at touch practice on the way home. Yes, park and ride has a cost, so you have to evaluate that in terms of patronage, network effects and impacts on feeder services, but Auckland has far less provision for park and ride than similar cities so why not get really serious about making it easier for people to catch public transport. If we’re going to throttle bus access by making park and ride harder and stopping a new harbour crossing (which would enable a dedicated bus corridor through to downtown), then why don’t we maximise use of the busway by letting select vehicle use it (for a whopping fee which can be used to build park and ride, improve pedestrian access or whatever). Because this would negatively affect its primary function. It may be hard to grasp but the busway works precisely because it is not clogged with traffic. What is your evidence for it needing other vehicles on it? A glance through the windscreen of a car? Additionally park + and ride, expensively, provides around 8% of busway trips. While the most visible, and most intelligible to the auto obsessed, this is not the most effective nor efficient way to increase uptake. Improving the service itself and access to stations by non driving modes, including, as mentioned in the report, intense development around stations, will generate more use more effectively and efficiently. Park and ride does have its place, generally at very distant stations serving disposed rural populations and where land is cheap and undeveloped. This is quite wrong, The busway works because it is not congested, but not being congested doesn’t mean there is room for many more vehicles. If you fill it up with cars then it fails just like the motorway next to it. In particular the station areas and intersections would have their efficiency destroyed by even a few hundred cars an hour. There is some room for continued growth in bus numbers, but even this has its limits as the busway patronage is growing so strongly (like 20% per annum for several years) and stations are already beginning to congest with bus movements. There is simply no room for any other vehicles, there is hardly enough room for buses alone to meet demand. “Throttling bus access” by not building enormous park and ride: Park and Ride is all but inconsequential for bus access, for the North Shore it’s less the source of less than 10% of patronage crossing the harbour on the bus each day. You know how most people get to the busway, they catch a bus! Park and ride is marketing to car driving bureaucrats who couldn’t conceive of approving or funding transport that doesn’t involves cars, it is structurally unable to furnish the majority of users and can never be more than a small component in reality. The number of carparks at Constellation and Albany put together amount to 1,450 spaces, which can only generate around 750,000 trips a year if each space is full every weekday. That sounds like a lot, however it’s total contribution is less than one years growth on the North Shore bus network which now moves over eight million trips a year. You could remove park and ride completely and this time next year we’d still have more bus passengers than we do today. There is nothing throttling buses, they are getting huge growth. If anything does throttle buses it will be traffic getting in the way. Hamish, the Hibiscus Coast Park and ride has 206 official spaces and a few more unofficial spaces. Average daily ridership from the HC station on the NEX is 2,574 (over 7 days so likely higher midweek). If we halve that, we get 1,287 individual passengers. That means only 16% of riders (plus maybe a few car poolers but my observations don’t support this) originate from the Park and ride. The remainder have all either been dropped off or are using the much improved local bus network to get to the NEX. Imagine then the difference if we could spend some $ on buslanes down Whangaparaoa Rd and Hibiscus Coast Hwy to improve speed, frequency and patronage even more? The same could be said about anything. Railways generate economic activity. Pens generate economic activity. Bananas generate economic activity. Can someone sensible please run for mayor, by campaigning something catchy like ‘enough is enough’ regarding motorway construction. 3billion for a ‘new motorway tunnel’ is insanity. Motorways generate economic activity by reducing the effective distance separating producers and markets and business and employees (agglomeration). So businesses (and labour) will actually move to be near motorways, improving competitiveness (unless capacity is allowed to be exhausted), not to mention opportunity and liveability. Yes, quality PT can do this and that’s one of the reasons why the CRL, despite a poor conventional BCR of 0.4, will over 100 years reap many times this level of benefit. In looking at how the rail system could cope prior to the CRL being commissioned, 40 million boardings per year seemed to be a necessary and reasonable target. This would not be achieved without cost of course. Forty new trains, some pocket sidings, and upgrades to signaling and possibly power supply. Train control in Wellington needs a major upgrade anyway apparently. AT’s apparent intention to aim really low for post CRL patronage really harms the benefit/cost ratio for the CRL and provides aid and comfort for the road lobby. Pardon? What about road pricing? That is weird because I thought road pricing was one of the things on their list. Why are they advocating road pricing if they dont know what it does? Thanks Matt, nothing reinforces the strength of our argument faster than your need to tackle our organisation rather than the issue we raise. For clarity, there is no contradiction in highlighting that we need both new capacity and pricing. We have a million people coming and, with the exception of some assumed widening (which is the reason that congestion is projected to be somewhat mitigated from the late-2030s), there is no new metropolitan motorway capacity other than the harbour crossing beyond programmes underway. As a direct consequence, all modelling to date shows network failure through the interpeak from next decade. We have a choice to either accept this and the impact on our economy and liveability or do something about it. I’ll really reiterate the point here that I am talking about the interpeak – non-commuting need – peaks will under any scenario be saturated. Pricing can be used to improve peak and shoulder movement, increase use of the motorway by maintaining flows and raise revenue for reinvestment in the network. Simply levying higher tolls to manage the network without new capacity will shift motorway trips onto local roads and provide inaccurate market signals about the cost of decisions. Not everything is a conspiracy, Matt. In fact, usually there are fairly good reasons for the way things are. If you can get 24hr, region-wide vehicle monitoring past big brother concerns, we’ll hop right onto your initiative. Keep in mind that because vehicles are mobile across regions, you’ll have to extend this solution out nationally to what is perceived to be an Auckland problem. The cost of this system will have to be met by people not all that fond of Auckland and not all that happy to do so. That said, with electric cars and other things it is inevitable, so in the long term we agree… but in the shorter term we’re somewhat more limited. Hamish, you keep saying that there are a million people coming, but are they really? Just yesterday, the AA was saying that the only answer for many people was to get the hell out of Auckland and never come back. “We have bought a section in Tauranga … Abandoning Auckland is the only way that we can see to get out of this god-awful traffic situation,” one member said. Doesn’t sound like the extra million people is going to happen – and building more roads to let them drive in on, is not going to be solving that problem either. Sorry, but the only way I can see Auckland growing, is by Public Transport. Auckland doesn’t need a single car more. I’m not anti car – i love the look and drive of cars – but cars are not the answer to Auckland’s problems. Would be very interesting if they shifted those motorway overlays so that the CBD of the other cities networks lined up with the CBD of Auckland. That would clearly illustrate that places like Vancouver don’t have any motorways anywhere near their CBD. The Pakuranga highway graphic highlights the lack of vision for AMETI perfectly. The problem with that is it would result in a 3 mode trip just to get the CBD for many – bus to LR stop, LR to Panmure, train to CBD. I would have thought a busway would be better here, as then buses from say Bucklands Beach, Howick etc could all join the busway and travel to Panmure. Conjecture: part of the reason for issuing this report now is to gain leverage in the ATAP process, because perhaps it is not progressing to NZCID’s liking? Interesting. My reaction was how have they accessed findings from ATAP before they have been released? Almost everyone agrees that we need better data. I’m worried ATAP needs an objective reset to seriously model radical re prioritisation to active and public transport as valid alternatives. Seems the brief and the conclusions have largely already been determined. Lets hope I’m wrong. Their “doubling down” of the AWHC is great. If they can manage to persuade enough people that it will only be effective if it is twice as expensive and even more ridiculous, it will make it far less likely that it will ever be built. Of course in most of those cities the motorways are rural roads and not driven through the heart of the city. 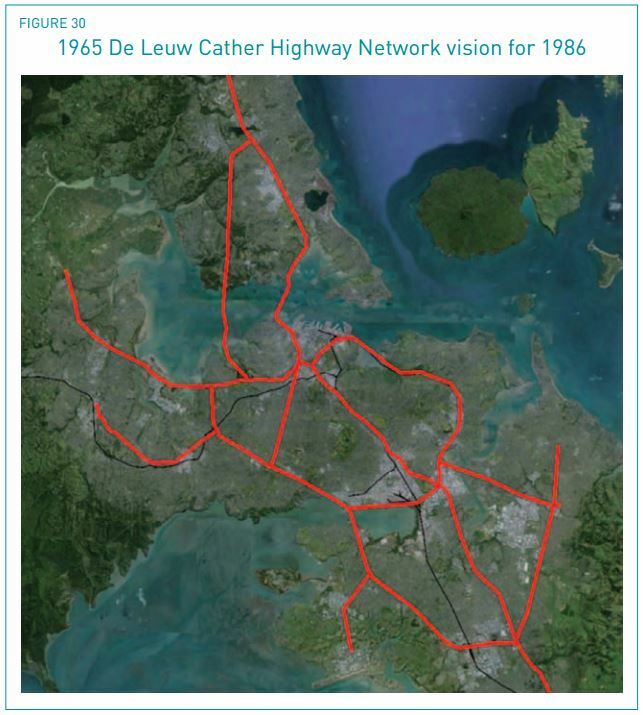 In Auckland we are forcing an exurban rural growth pattern, we will need lots of motorways to connect it all. We have decided that growth from and about the Auckland City must be severely expensive, preferring growth to be dispersed widely and hence much less suitable for efficient public transport. This is Hamish Glenn, Policy Manager at NZCID. I’m going to spend a bit of time today responding to comments and questions on the report, welcome any questions, I’ll do my best to respond to them today. Hi Hamish, thanks for stopping by. As mentioned in the post I do agree with don’t of the stuff you’ve in the report, particularly issues with land use and that PT investment doesn’t seem to deliver enough outcomes (although I believe some of this is due to poor modeling that is weighted against PT). What I find odd though is that there is no discussion on what it would take up make the PT network with better. Is it just that NZCID agree with AT’s proposed investment (particularly at the RTN level) or are there projects you think need to be added or cut? In other words if PT isn’t performing then what does NZCID think is needed to get it performing? Another thing, there doesn’t seem to be any recognition of the value of having fewer drive. At some point all motorised transport systems will fall over, be it a digger hitting a bridge or a train breaking down etc and when that happens chaos ensues. We can’t afford to have redundant transport corridors waiting around for when that happens but with a more balanced system, one incident means only one portion of the city is affected. That in itself has a value but if seldom realised. Resilience is critical and you correctly point out that it is not well valued. It cuts many ways though. With an eastern corridor in place the impact from the other day would have been less significant just like it would if twice as many people used PT. I would highlight that the digger incident happened at I think 1:15pm – middle of the interpeak. The system is so stretched now during the day that even at this sort of time on an average sort of Monday an event can have severe repercussions. Did someone say Auckland was not designed for public transport? Prior to the construction of the Southern Motorway in the 1950’s and 1960’s South Auckland was a series of independent towns surrounded by rural or industrial land all connected by the rail line and the Great South Road. If you look at Otahuhu, Papatoetoe, Manurewa and Papakura they are like knots in two pieces of string that is the rail line and the Great South Road. These places organically evolved as settlements as Auckland especially its then industrial city centre and port grew. Come the 1950’s and 1960’s we caught the American suburban and motorway bug and the march of the Southern Motorway would begin from Mt Wellington (and later the City Centre) and go through in stages to first the fledging Manukau City Centre (via Redoubt Road), then Manurewa, Takanini, Papakura and finally in the 1990’s connecting with State Highway Two on the other side of the Bombay Hills. With the motorway came apparent freedom (the opposite would ring true fast enough with chronic congestion) and the freedom to sprawl following the path to the Southern Motorway. And up until recently that sprawl advanced as far south as Takanini with Papakura being isolated before BOOM and now that sprawl on its way to Pukekohe. In reaction to this new sprawl the Manukau City Centre was formed in the 60’s. Where things would go wrong fast however, rather than having Manukau built next or connected to the rail line (it would not until 2012 and even then we are still missing the Manukau South Link that even Panuku strongly wants) it was built next to and connected to the Southern Motorway (and later the South Western Motorway a few years ago). Why? The focus of Manukau as being a car-centric centre with wide roads rather than the narrow roads seen in existing South Auckland towns and links to the rail system to allow passenger movements to and from the Centre. That road focus even with the Manukau Station opening in 2012 would dog Manukau’s potential despite good demand for residential and commercial on the Centre. The point? Up until we took our motorway and sprawl fetish Auckland WAS designed around mass transit be it trams, heavy rail or buses. Heck even Manukau despite missing a rail link for so long and dogged by cars had all the South Auckland buses congregate to it. It was only in the 90s and 00s with places like Botany and Albany have we seen things around the car and not the P/T system and it shows. So yes Auckland WAS designed and we are trying to catch back up again with public transport. I think they may be referring to Auckland in general. On the north shore we don’t have rail, so there are parts that are not as well served. Having said that, when I worked in Manukau (15 years ago), despite living near the train station in Otahuhu I would never have thought of using a train, because even once at the train station at Manukau it would take 20+ minutes to walk to work (and 15+ minutes from the new station I would think). Re: Botany, whilst I agree it has a lot of roading, it’s not how I would design it if I was aiming to make it car friendly. There is no motorway so is always going to be very slow to get in and out of and will take a long time to get around. Albany is a different story and the area around the Albany Mall is some of the best road design in the city. Maybe it’s because there aren’t that many people there yet, but even at peak hours the traffic is quite acceptable because there are enough 4 lane roads, close to the motorway and of course the bus station. The question of whether PT could replace the need for additional road investment is discussed on pg 42-43, albeit at a high level. The reason we did not go into heavy detail, for example, by conceiving projects and roughly costing them in a similar sort of way we did for the eastern corridor, reflects the previous couple of pages, as well as Fig 23 which shows roughly a 50/50 split on council spending (including NZTA contribution) on local roads vs PT over the next 30 years (motorways excluded). Summarising our point here: authorities are not underinvesting in PT (though there’s no doubt we have in the past and catch up is required); but even after a generation of spending half our money on PT, it still provides for just 10-12% of the equation (Fig 14); there’s lots of opinions about why this is the case, but the most measurable and objective one is that it’s because PT will remain slower than cars (Fig 33); yes, we could roll out light rail, rail, busways, etc to get PT operating on a competitive time basis with cars, probably for an equivalent cost to an eastern corridor; but opex will kill us. Just implementing the Auckland plan will see opex on PT hit just south of $2 billion per annum (Fig 34) in the 2040s. We pulled the equivalent graph for local roads spending (LTP2015, v. 2 pg 48), but that’s just slightly smaller than opex+capex for local roads which will still provide for over half of all motorised person km travelled (plus footpaths!). The numbers simply do not add up. From pg 43, we underline why this is the case – land use. Auckland is not designed for PT due to a lack of grid pattern, spread of jobs and homes, existing economic make up, poor street width provision (UN Habitat report), etc and the Unitary Plan doesn’t resolve the issue. Our recommendation is, therefore, to revise the Unitary Plan and, if you can get the right provision for intensification along corridors, then tie new PT to that development using some form of property tax mechanism (betterment levies, value capture, tax increment financing, etc) to subsidise the cost of the PT, thereby improving its business case. By arbitrarily excluding by far the biggest transport spend; NZTA’s, the report decides that the ‘authorities are not underinvesting in PT’. Transit can be faster than cars if it’s given priority. This is fixable. Opex looks high, sure, but what is the OPEX of Single Occupancy Vehicles? How do other Cities in the world manage? This is how taxes function. A grid pattern helps, wide streets help, but what about Zurich? What about Paris? Tokyo? Seoul? Singapore? No grid is no excuse. These are all excuses for why roads are needed instead, without any critical assessment of the failings of roads in any large city. What are the wider impacts of a decision? What is right for society, the environment, the poor, the young, the elderly? It starts well but the scope is only wide enough to justify bigger roads. Could you please clarify your thinking on road pricing and its ability to manage congestion. At the right price, road pricing will by definition manage congestion, yet in your report you say that the only way to avoid increased congestion (let alone reduced congestion) is via expansion of road capacity. There’s a bit more discussion on this point on pg 68 than I can get through here, Matthew, but I guess I’ll summarise what I can by saying that what we should be aspiring to do is “maximise utility”. We don’t want people paying any toll higher than they have to, just like we don’t want anyone paying more for PT than they have to. We want people to pay the amount which accurately covers the cost of their decision. I guess a key concern of the Minister, AA and others is that tolls may be used to fund projects which do not benefit the toll-payer. From an economic efficiency perspective, you want to minimise that. What we discuss on 68 is an approach which, conceptually, balances the revenue from tolls with capacity in the system – i.e. use toll revenues to fund capacity expansion AND that proportion of PT, etc which reduces motorway use. When capacity starts to fill you’ll have to raise tolls to ensure 60-80km hr on the network because that’s the point at which you get the most people using the motorway. At some point those tolls will be high enough to justify capacity enhancement and you might then be able to drop tolls to ensure your 60-80kms before raising it to manage demand again, and so on. It’s not quite as simple as that, but that’s the idea (and also why capacity and tolls are required). I have never heard of this idea that hypothecation is economically efficient. On the other hand market clearing road prcing is almost universally considered by economists to be economically efficient. Why is hypothecation economically efficient? What you describe sounds reasonable, depending on how you decide when to implement new capacity. But the thing is – until we actually know how much people are willing to pay, we dont know whether and how much capacity will be required. So shouldnt you be advocating – tolls first – wait and look at the response – add capacity if justified (i.e. profitable). The conventional (I believe) understanding of when additional lane capacity is justified from an economic perspective would be: Additional lane capacity is justified when the investment to build operate and maintain the additional capacity results in a fair rate of return on capital that will be derived from the net increase in tolls generated from the additional capacity . Is that what you mean? The examples you cite are interesting. Transpower is run as a regulated monopoly as is Vector. Both of these companies provide a return on capital to their shareholders, i.e. they make a profit. Requiring (and allowing) monopolies to make a fair return on capital is economically efficient because it ensures that the investments made by these companies is economically sound. Needless to say, hypothecated revenue that is continually invested back into the asset from which it is derived does not allow any return on capital to be realised and accordingly will result in overinvestment, i.e. uneconomic investment. Perhaps you can square this circle but I am confused. Buses from Pakuranga, Stonefields or wherever in Auckland should run to the nearest train station – Not the City. The rail network has the capacity to grow and is not subject to the congestion that affects Auckland. Exactly! Bus lanes on local roads to enable fast local services to rail. Yes of course this is the case. And the good news is that that transformation has already started. What is really needed, which is completely the reverse of NZCID’s plan, is to accelerate and expand the addition of the missing transport networks in Auckland: Public Transport, especially a full city-wide Rapid Transit core, and Active networks; cycling and walking. In this area Auckland Transport have good plans, but they are too constrained by lack of funding, especially as too many resources go into doubling down on the existing drive-only network that is mature, and over-used. If you’ve got one over-fed and bursting child and two starving ones, isn’t the obvious solution to spread the available nutrients more evenly between the three, rather than keeping to stuff ever more grub into fatso while telling the undernourished ones to lift their work rate and expecting the first to thrive? The important thing to understand about city morphology is that land-use and transport growth do go hand in hand, so even in an unhelpful planning environment just fixing the transport priorities will drive different, and better, development outcomes. Got a sprawlly and overly auto-dependent place; CHANGE WHAT YOU’RE DOING to change the outcome. The claim that its too late to change is simply a failure of the imagination, and a failure of observation of recent trends. C- must do better; suspect student began with the answer and tried to back-engineer an argument. I think you’re actually agreeing with us on this one, Nigel. We won’t get the land use change without planning and providing for it, though, so yeah, welcome to the club. If the modelling shows we can do this in timeframe which avoids the needs for more investment, then that’s great. There’s no evidence yet presented which shows this is possible. I wouldn’t worry too much about the land use issue around transit corridors, particularly rail. Developers are shrewd and were already applying for high(er) density developments on these corridors prior to the PAUP process and regardless of the operative zone development controls. Most of these discretionary activity applications go to hearings but the commissioners can generally see the wood for the trees and approve them. Theres quite a few of these developments going in, and proposed to go in, around Grafton Station for instance. I agree there’s plenty of quirks in the PAUP though – the zoning around Morningside station is a cracker (multiple PT options, walking, cycling options, a perfect storm for intensive residential development and apart from a small bit of mixed use, a very big chunk of light industry remains). I haven’t had the time to read this report but it sounds like these guys are on the right track. Rather than taking the “car is bad trains/buses are good” approach adopted here at Transportblog it appears these individuals have taken a widen approach to Auckland’s transport problems. A good transport system will have excellent functionality across all transport types. If we continue to ignore Auckland’s roading system it will come back to bite us as well as costing us valuable productivity losses. Auckland’s motorway/roading system is underdeveloped just like it’s rail system. The Western wing will provide an element of robustness but until we recognise the fallacies of our current approach to roading we aren’t going to get far. For instance there seems to be growing awareness that roundabouts, not traffic lights are the way to go which is pleasing to see. I certainly don’t have the stance of ‘the car is bad’ … But I 100% agree with that “A good transport system will have excellent functionality across all transport types”. so can we start with funding each transport option evenly (equally) then? Might make for a more level playing field that way. It seems crazy that the motorway expansions and ‘new motorway connections’ are seen as answers. What about a rail connection from Manukau to Panmure? What about rail to Albany? Heck even Orewa! Even if a politician was to put these projects forward they would be slammed as PT crazy. But the motorway options are just accepted? I couldn’t agree more 01anthony – but I might just clarify how transport is funded, as it seems a number of people are not clear on this. The national land transport fund is entirely comprised of charges applied to vehicles. So any time NLTF funding is committed to a project, and this includes almost all transport initiatives – state highways, local roads and PT – it pays to remember it comes from taxes on cars and trucks – fuel levies, road user charges and licensing. State highways, with the exception of some recent top ups via the future investment fund, are 100% paid for through this mechanism (or tolls). Local roads, on average, get 50% funding from these vehicle taxes via the NLTP and 50% from rates. PT is the same – user charges account for half, vehicle taxes half. Environmental impacts and land consumption complicate things a bit as carbon is not really priced and rates are not charged on most transport infrastructure. This is actually quite a good system overall because transport is so expensive that it almost always needs a public subsidy and this approach tries to balance that subsidy to reach an “equal” outcome. If you want PT, you can have it simply by moderating the fares people pay. If they don’t want to pay those fares, then you know they don’t really want it. Same with roads – if you want more fine, but then road charges will have to go up (and they have). Cost benefit analysis provides a means to forecast how much people want something. It’s not perfect, especially because it doesn’t capture land use change on big projects and tends to over-emphasise short term impacts on road users more than the economy as a whole, but since road users are the ones that subsidise almost all transport decisions, this partially makes sense. A benefit-cost ratio actually gives you some idea of how much people want something, so I suggest we perform robust cost benefit analysis on projects to understand whether those rail projects you mention stack up against road expansion and choose the ones which people want (as determined by what they do). Nearly correct Hamish but wrong on PT opex funding: 50% comes from fares and 25% from the NLTF and 25% from Rates. Road users are major beneficiaries from public transport use. Good luck driving anywhere in Auckland save for those 60,000 week day trips on the rail network, and that’s just the rail network, buses currently carry 75% of AKL’s PT users and if all these people drove there would be no chance of anything moving. So the subsidy from Fuel Tax and Road User Charge is a form of user pays; they are pay a little towards having clearer roads. Essentially PT has great difficulty in monetising its value in a similar way that driving has great difficulty in paying for its externalities. These are economic costs and benefits not financial ones. An imperfect system, but at least one not as broken as in the US. Happily too the electrification of the rail network and the subsequent boom in use is greatly improving cost recovery and therefore lowering subsidy levels, we look forward to this continuing. That’s right Patrick; in the real world of space and time, it’s PT that massively subsidises road users (and general populations, with less pollution, better health, etc.). It seems the models don’t really see or capture this reality. Funny that. To me this means that any transport project should benefit road users. In fact this was the reason that the Northern Busway was funded by NLTF. With that in mind, does the NZCID support high capacity rail to the North Shore? If not why not? Hi Cameron. Speaking conceptually (because reality is of course a bit more tricky), yes, any PT project (or cycling for that matter) should demonstrate it carries benefits for road users by taking cars off the road – if it is to receive NLTF money, and that funding should be representative of the amount of cars it takes off the road. Unfortunately, as much as everyone, including myself, would love to think that if we throw in some good PT people will jump out of their cars, evidence on this internationally seems a bit mixed. That is, PT is great for providing options, but it doesn’t seem to reduce congestion, at least not in the short term. So in reality, PT (and cycling) projects shouldn’t get a lot of funding from road users. But that doesn’t mean they’re not worthwhile and we shouldn’t do them! It just means the funding mechanism should be different. This, I think, is actually at the heart of differences between what the supposed “pro-PT” and “pro-road” lobbies say. The best mechanism by a long stretch to fund public transport are land-based ‘spatial’ taxes. That of course is because PT is heavily spatial in its impact. Unfortunately, we do a lousy job of connecting the beneficiaries of PT investment to the funding of it. The CRL is a case and point. Thankfully and appropriately (and they didn’t get enough credit for this), central government have indicated their portion of the CRL will come from general taxes, not the NLTF, because the benefits to road users are not reflective of the project’s cost (though road users certainly should pay something). If the CRL doesn’t benefit road users, who does it benefit and why are we doing it? It benefits the economy through agglomeration, hence why general taxes which fund things like conference centres is an appropriate tool, and it benefits local land owners – and they have got off all but free! They’ve been hit by general rates, but those property owners in the CBD and around train stations regionally have seen the value of their properties increase markedly and the only thing they pay is a tiny increment via the increasing proportionate capital value of their proprty. This is actually an outrageous and punitively regressive taxation policy. We must find methods to link the costs of PT to the beneficiaries of PT. Users pay their “fair share” – about half. Affected property owners get millions of dollars of untaxed capital value and pay nothing. It is in my opinion deeply unethical to tax regionally in order to inflate property values locally and this is where PT funding should come from. So, short answer to your question Cameron, rail to the Shore is $10 billion (2010 Harbour crossing study), if economic impacts+decongestion+property value improvements exceed this and opex, or at least are better value than alternatives, then yes, I’m sure we’d support rail to the Shore. Haven’t seen this data yet. Two words, dude: Northern busway. Good luck driving a car over the harbour bridge right now if that hadn’t opened when it did. Imagine what could happen if the buslanes were extended all the way to the end .. The key is a *separated* route, as Transportblog has promoted for ages. Add as many lanes of asphalt as you like; it won’t fix congestion. Would help line the pockets of big construction companies I guess, if you were being honest about the choices you’re promoting. What if they really want it but just can’t afford it? Is that real-life situation allowed for in the model? Hamish, roads are starting from a huge historical and unfair advantage. Did anyone do Cost-Benefit analysis when the tram network was ripped out in the 1950s? In the 1960s when the rapid transit system suggested by the De Leuw Cather report was ignored? Public transport has suffered ever since. A lot of cost-benefit analysis done now would favour roads because the arterial and motorway road network is so much more developed than public transport. Expanding the public transport network directly benefits road-users because it takes people off the roads and therefore unclogs them for people using the roads (which can be public transport users at other times of the week or day). No, there wasn’t a lot of cost benefit on those early decisions. But this is a very important point – we can’t make policy based on whether decisions made 50 years ago were fair or right. We have to make the best use of the hand we’re dealt. We have been dealt a land use package which doesn’t support PT or intensification and that’s what all the modelling is saying. We can get angry and wring our hands, we can spend a fortune to cut off our nose to spite our face, or we respond as efficiently as we can. In our view, that means not repeating the same mistakes: let’s design and fund new areas for density and concentrate brown field redevelopment in a few focused areas where the costs are lowest. Generally, that will be around train stations and decent roads. What? There is nothing to say Auckland doesn’t have the layout to support PT. Unless you can come up with some evidence? Bryce, take a look at pg 37 of the report which cites a 2013 UN Habitat report. It found Auckland places alongside Moscow in terms of land provided for movement as a proportion of land use, plus lack of grid, etc. Hamish the idea that a grid is some kind of necessary precondition to a PT network is clearly unsupported by all those great european and asian cities with no grid yet great PT Networks. This is an American idea, and the US is hardly the home of cities with great or efficient PT systems. With a couple of rare exceptions. That report is clearly written by a consultant with a narrow view, possibly one as auto-dependent as yours. That’s right Patrick; if that’s the argument, a cul-de-sac-type road layout with good walkway/cycleway/greenway connections could be made just as accessible to train/metro/tram stations as a grid-type road layout (in some cases possibly even more so). Yeah, if the goal is to drive to PT, Auckland is rubbish. But that’s not the goal. Plenty of viable corridors and the ability to create bus lanes, cycle and walk connections and density to make stations worthwhile. If we choose to. That’s actually an excellent analogy, The Real Matthew – if you feel like it’s a shame that we neglected our rail system for so long, you can’t reasonably argue we should abandon our road system. That’s a weird comparison. No one is proposing that we close or stop maintaining existing roads. Yes this is a nonsense allegation that we get from time to time. No-one here is suggesting abandoning our road networks; simply that we use them more efficiently; we agree congestion is inefficient. An inefficient and unnecessary over-use because the system lacks balancing alternatives. Expanding the one dominant network without first building the complementary ones is not only certain to lead to further inefficiencies [known as congestion] but is also very ineffective. Increasingly enormous sums need to be spent to add pointless additional capacity. Pointless because it doubles down on imbalance and auto-dependency. One of the disasters of the highway sprawl revolution of the post war era was that it began with the destruction of existing networks, for example AKL’s tram system. Another was the destruction of entire communities and the creation of severance especially through the construction of the inner city motorways. Contrast this with the supreme spatial efficiency of the CRL. This laparoscopic surgery compared to the amputation of previous era change. That is a mistake no-one wants to repeat. No, but in 1959 if you had suggested not building any roads at all and pursuing a trams only policy you would have been rightly laughed at. Hence why everyone is laughing at the NZCID right now. On that second point they suggest building a new dense city for 100,000 people and 30,000 jobs on greenfield land somewhere in South Auckland. Maybe they’ll accept low density exurban sprawl? There is going to be a city of 100,000 people in South Auckland, Pukekohe is to triple in size and swallow up Paerata. A low density city akin to Hamilton of 20 years ago is to be created. I’m not quite sure what you mean here, but the point we’re making is that by going into greenfields you can masterplan development to accommodate an identified level of density from day 1. Retrofitting areas designed for low density with higher density is a major reason costs are ballooning and road performance falling (without a commensurate increase in PT). In other words, well designed urban planning will result in less sprawl. You have a point here. As long as it will be of a) a size that it big enough to sustain itself b) there is enough density. A new town in Dairy Flat, for instance, could have a marked effect. See the Dutch city of Almere as an example. It includes mixed densities, main line rail link, local busways (yes full busways, not bus lanes) and cycle lanes / paths. We’ll have a busway, but right beside a motorway and only accessed with park-and-rides. It isn’t going to be dense enough or have the right land use to work, even with the best street network design and cycleways for Africa. It could happen if and only if we build the Rapid Transit infra AND deliver the service before the lands gets formed. We have yet to do that anywhere ever in Auckland. The best chance is on the rail line south pf Papakura. This would mean electrifying the line, building the stations, and delivering a frequent service enough ahead of the development. At least the line is already there, and there are even services going by, with some vision real TODs could form around new stations in Greenfieds there. Will our institutions manage it? Given our funding habits and political consciousness [ie it would get attacked as ‘wasteful’ and empty’ while it built ridership as the compact new community grew around the stations], I think this is extremely unlikely. What we always do is build roads to empty paddocks then watch as auto-dependent and highly dispersed subdivisions form. This is of course a choice, we don’t have to do it this way; but do we have the wisdom and courage to change? If there’s one thing the report illustrates pretty well, it’s the poor integration of land use planning with transport. We’re planning vast and expensive improvements to public transport in the Albert-Eden board area (CRL, light rail), and yet it’s one of the most development-limited areas under the Unitary Plan. In many cases even more limited than it was under the ACC plan. I know there’s usually a gentleman’s agreement among councillors to let each individual councillor have most of the say over what goes on in their ward. In this case, though, I think the rest of the council needs to gang up on Fletcher and Casey (and Lee) for the good of the city, and approve large-scale upzoning in the central fringe and streetcar suburbs, over their objections, and the objections of the local boards. For those rail stations that has high density zoning, a new express train should be added to stop only at stations that allow density growth, skipping all other stations that has no density growth. I am pretty sure after a while, the area that has density growth will be more desirable with better amenity, transport and vibrance. Totally agree. In Perth (and most other cities with a 21st century rapid transit system), it is normal that there are express trains that miss out several stations. This cuts the time down in peak periods to 20 minutes to get from the northern suburbs to the CBD – a distance similar to Papakura to the CBD. Not possible given tracking in Ak, as express trains would catch up with non. Also express trains would have to travel slowly through all stations due to safety. Agree that it’s not possible with 10-min frequencies, but we have run express services before when the timetables were less frequent and the trains ran full speed through the stations. Also at some point we will likely have a third main line. Trains are free to run at full line speed through stations – empties and freight do it daily here and overseas. Express running is part of the plan post CRL and the required lines are virtually only a matter of someone signing the cheque so KR can continue and finish them off. Thanks for coming here to answer questions, I have a few & will try to put them as concisely as possible, however first let me say I agree with much of the report and many recommendations such as on land use, and congestion pricing are spot. I like how unlike others you don’t think Driverless cars are the answer to everything. 1. I assume NZCID’s land use is based on either the PUAP or the AC’s now pulled submission. Given now the AC has pulled there submission giving more weight to HNZ, MBIE & Environment which call for greatly higher density and look like they are supported by the panel. If for example using the HNZ Beca prepared submission as an example where over 72% of urban residential land is zoned THAB or MHU compared to 18% in the PUAP would this change NZCID recommendations? I mean would these projects not provide more benefits than the proposed motorway? 3. 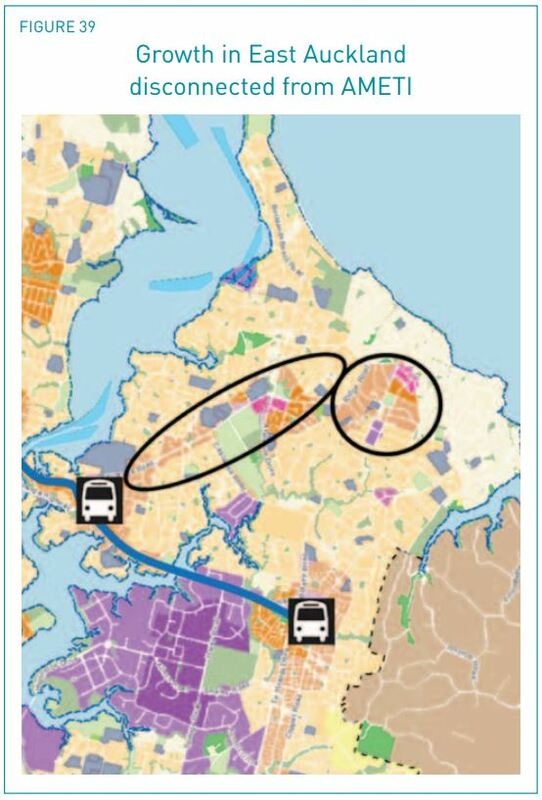 Did NZCID consider the movement towards the new bus network & integrated ticking considered international best practice, where routes are simplified, more local, more frequent as a result connecting to rapid transit as a solution to expanding the PT networks catchment over park n rides. 4. Lastly for the Eastern Motorway & AWHC did NZCID intend it to also include a Busway extension or Rail, or would it be general traffic only? I think you forgot the budget for the Eastern Suburbs line Harriet. 1. I guess what we’re saying in the report is that we’d like transport modelling to be probably THE major determinant of where growth goes in Auckland. We’ve submitted to the PAUP panel that we think the Unitary Plan in its current form is unworkable because projected congestion cannot (and won’t) be tolerated. We’ll become a lot more supportive of any land use-transport plans which show congestion falling – and there is no reason why it shouldn’t fall, even with another million people. (Many cities of 2m+ have less congestion than Auckland and not all of them are deserts). So I guess my response is, yes, maybe, but with a Tom Cruise like, Show me the modelling! 2. Yes, no doubt about it, an eastern motorway of any form would be extremely expensive. I’ll try to skimp on my answer here a bit by referring to my response to Matt up above at 3:28pm yesterday, which partly helps me answer this – the operating costs of such a PT network would probably be the bigger issue than the capital. Opex for roads is much less (NZTA currently spends ‘just’ 100m pa on Auckland state highway maintenance). But the other thing worth noting is that there’s two components to the question of funding priorities. One of course is the cost itself, but the other is where that cost lies. An eastern motorway, delivered in sections, tied to a network tolling system, would probably be self funding (perhaps with a top up from the NLTF to reflect petrol taxes paid while on the network). Significant extension of the PT network would require general taxation and ongoing subsidies. I know that’s different to the benefits question you raise, by implementation is important. Benefits themselves would need to be modelled, not sure what those would say. Hamish, in response to #2 have you considered how the balance might change if vehicle operating expenses are included, while I realise they are strictly speaking personal expenses in that I decide how much to spend on my car and when I use it, they are none the less real costs. Good question Jezza. I know Julie Anne Genter has got some stats on how much private vehicles cost once you add up public and private costs and the number’s fairly staggering. The important point to note in any thinking (private or public) about spending money, however, is not which is cheapest but which delivers some balance of best value for money/greatest benefit/affordable. People, for differing reasons, spend vast amounts on cars – some far more than they have to – because they get benefit out of it. What we’re trying to do with public money is maximise societal benefit with the amount we have. Things get pretty tricky pretty quickly if we try to tell people it’s in their interests if they don’t drive (or play injury-prone rugby or eat unhealthy fast food). Auto-dependent cities cost their users much more in operating costs than PT oriented ones. Auto-dependency is simply the most expensive and least effective way of organising cities. This is a simple fact, proven again and again globally. In fact the only cities that can function on near total auto-dependency have massively general taxation subsidised driving systems and tend to be in oil rich states. The poster city for this is Houston in oil rich Texas, with extremely cheap gas and freeways built by taxpayers in New York and San Francisco. Yet, according to Forbes, it is the place in the US where the highest proportion of residents’ income, over 20%, goes on simply getting around. It has freeways over 20 lanes wide that remain congested. We cannot afford to go down this road, literally. Hamish and NZCID have no answers to these facts. And yet, the average house price in Houston in December was $280,000 (quick google to find that, I’ve heard around $250k in Texas from other people). Nothing is perfect, but in general making land available keeps prices low. One issue is that in Ak, you can use PT but you still need a car. The comparison is only fair if PT exists to the extent that no car is needed. Obviously this is not a realistic proposition for Aucklanders. Agree, but it is certainly getting to the stage where two car households will find it increasingly easy to move to having one household and also I suspect it will become increasingly common for those living in apartments and townhouses in and near the CBD not to have cars. It’s important to remember we are discussing future proposals here not the present. 3. Yes, to the extent that these are picked up by ATAP modelling. I don’t know how on earth the modellers achieve this, their art is something of a mystery to me… I just look at the outputs and then ask them to explain things that look strange. 4. Yes, we’ve assumed there would be probably a lane rather than a separated busway dedicated to buses, but in either case I think particularly in that second big section on the Howick-Pakuranga side, there’s a huge opportunity for direct buses to the CBD and north shore and western (future) busway destinations. Well done, Harriet. Hamish, the ball’s in your court I think! I’ve noticed for some years that this is a classic tactic used in propaganda/disinformation. As far as I can tell, Matt highlighted only one apparent contradiction (that we need pricing and capacity), which I thought I fairly comprehensively showed was inaccurate based on the scale of growth anticipated, but I’m happy to revisit that if there is still some confusion. Also happy to respond to other apparent contradictions you have picked up Jamie, though I’d prefer it if people read the report and make those comments based on the report’s content before highlighting apparent contradictions. There were more but it was late when writing it and the post was already too long (and don’t feel like writing a long comment on my phone. Another one was the AWHC case where you say it isn’t good (agree) but that solution is to make it bigger. The decision to proceed with an investment is based on the costs and the benefits. If it’s more expensive, it just has to deliver higher benefits. The comment was just noting an observed pattern; not meant to accuse anyone personally (at the time of the comment, I hadn’t yet read all of the other comments and didn’t know that NZCID had access to ATAP modelling – in hindsight it now seems to be more a case of bias in the modelling assumptions and in what’s counted and what’s not). As for contradictions, you’re right, I’d have to read the whole report in detail to identify and list them (I’ve only skimmed through the report so far). I understand you’re trying to achieve “the art of the possible” within the context and constraints of the present situation and trends. However, what I think most of the people here are trying to express is that it is possible (and necessary) to change path from more road-based infrastructure/development to more public transport-based infrastructure/development. 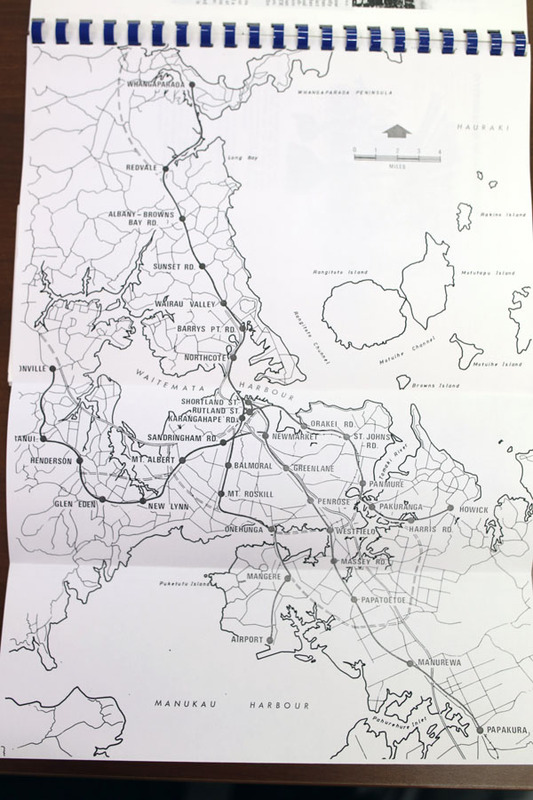 Auckland changed paths from public transport to roads in c1951. The fact that it changed path once should mean that it can change path again (other cities have done it/are doing it). The (admittedly apparent) underlying paradox in the report is: seeing that more roads ultimately result in more road congestion, and then proposing more roads to alleviate road congestion. Which make it a lot more cumbersome to catch a bus, especially out in the suburbs.